Cluss promoted the quality of urban life by designing enduring, beautiful school buildings for Washington's students, both African-American and white. His public schools in Washington enabled all segments of society, regardless of wealth or race, to experience architectural beauty and style. 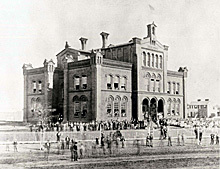 Before the construction of the Wallach School on D St. between 7th and 8th Streets, Southeast, in 1864, most public school classes in Washington were held in rented rooms and makeshift buildings. Mayor Richard Wallach envisioned a "school within the reach of every child" and yet a building whose beauty and elegance would instill pride and admiration in both students and citizens of DC. Mayor Wallach sought to change the widespread notion that public schools were for paupers. Wallach School reflected the most modern features of its day, with scientific ventilation and heating systems, a large assembly hall and covered passages to the outhouses. Wallach operated as a school until 1949. It was razed in 1950 and replaced with Hine Junior High School.